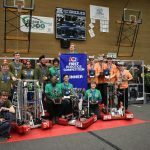 April 3-6, Team 2910 Jack in the Bot traveled to Tacoma to face off against 64 teams from Oregon, Washington, and Alaska for the Pacific Northwest District title. Ranked number 1 in the district going in to the event, expectations were understandably high. As game action began, the team started strong, winning our first few qualification matches on Thursday afternoon. Friday qualifications were exciting, and even a little scary, as a few mishaps caused some setbacks. We lost one match, and missed the opportunity for several ranking points in two others, but rallied to finish strong. At the end of quals on Saturday, with a record of 11-1, we held the number 4 seed for the event. During alliance selections, the number 1 seed, Team 2046 Bear Metal called us up to join their alliance which we gladly accepted, and then we added Team 2097 Lion Robotics as the third partner. The alliance proved to be unstoppable, winning the quarter- and semi-final matches in straight sets (2 of 3). The finals were thrilling against the number 3 seed alliance of Team 4488 Shockwave, Team 2930 Sonic Squirrels, and Team 5468 Chaos Theory. The matches were hard fought, but our alliance prevailed in two straight matches to bring home our fourth winner’s banner this season. Team 2910 Jack in the Bot also received the Quality Award sponsored by Motorola Solutions Foundation. At the end of the event, we retained our number 1 ranking in the PNW, and are excited to have officially qualified for the World Championship in Houston later this month.